Heather Hall of Ferreting Out the Fun joins us today for Day 23 of 24 Days of a Baltic Christmas. A native of Virginia currently living with her husband in Rīga, Latvia, Heather is passionate about food, history and animals, and brings a curiosity and fun-loving attitude to most any experience that comes along. After a short fall visit this year, I didn’t think Tallinn could get any more charming. Then I visited in December. A colorful Christmas market set up in the medieval Old Town Square created a scene so beautiful it looked like a fairy-tale come to life. Despite frigid temperatures, we browsed the stalls for hours, finding handmade Nordic elves and Viking ornaments while sipping steaming cups of mulled wine. We paused only to admire the live reindeer or to warm up over a meal at one of the restaurants lining the square. One day Santa even joined us for lunch! Riga’s Christmas market is bigger and busier, with a larger variety of products and food on offer. I enjoyed an ostrich-meat pie and cup of hot sea buckthorn juice while perusing everything from knitwear and woven baskets to candles and ornaments in the shape of traditional Latvian symbols. Instead of reindeer, Riga boasts a small pen of sheep and bunnies, plus a toy house display filled with cats up for adoption. I find myself returning again and again, even though I’ve already bought all the gifts I need! Thank you Heather! Read more about Heather’s adventures at Ferreting Out the Fun and connect with her on Facebook, Twitter and Instagram. 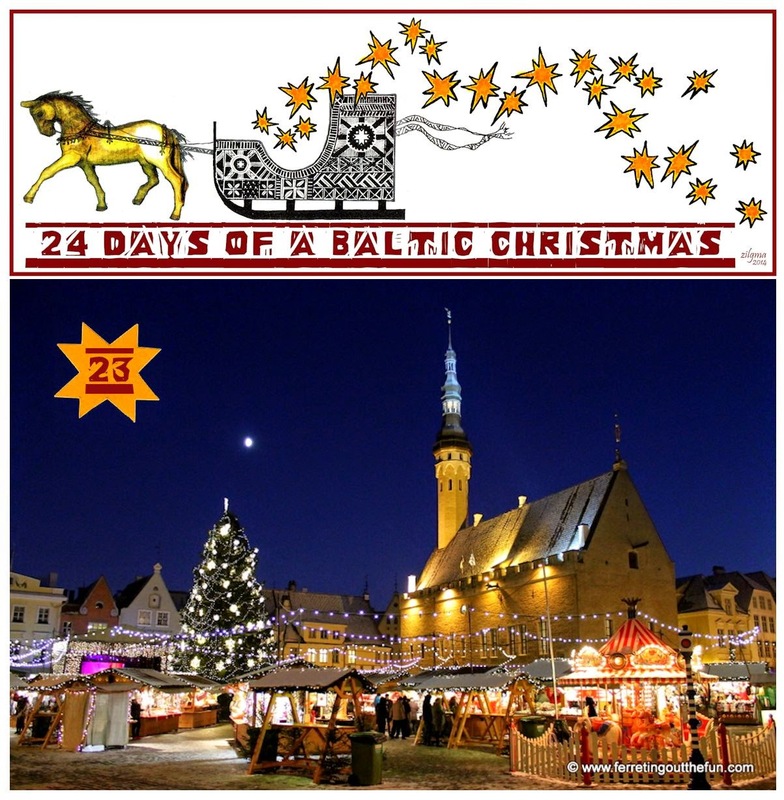 Only one day remains in the 24 Days of a Baltic Christmas series; I hope you’ll join us tomorrow, for Day 24!! !